My 14 year old daughter had a serious sprain in her right ankle March 31, 2007 playing volleyball. She then dislocated her right kneecap in PE (playing football) September 27, 2007. We did not see an orthopedic specialist. Our family physician took an xray, said nothing was broken and referred us for physical therapy. We did that 3-4 times a week for 7 weeks and then was released to continue it at home and a brace during activity. 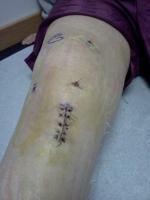 On April 12, 2008, my daughter dislocated her left kneecap (this time). This time we went to see an ortho specialist. An xray was first and he immediately saw the problem. The femoral groove for the patella was way to shallow on both knees and the patella itself was not sitting anywhere near the groove. We then went for an MRI. The MRI showed no damage to any ligaments or tendons (thankfully) but the radiologist noted the shallowness of the groove and the placement of the patella itself. The surgeon told my daughter and I that the groove should be like a bowl but it was more like a saucer. He also said that her ligaments and tendons were "loosey goosey". He suggested knee surgery on both knees (one at a time). He said he would go in and release/cut the tight ligament/tendon and then he'd have to go on the other side and "shorten" the other loose ligament/tendon. He said it would be painful, very swollen and a long intense recovery with physical therapy. He said this would not fix the shallow groove issue but would hopefully hold the patella in place by tightening everything around it. My daughter is an avid volleyball player and soccer player. She loves both. She plays on two competitive volleyball teams and the school soccer team. I asked our first physical therapist his opinion on this and he said that she is looking at 2-3 months of intense therapy without surgery and she would need to change her activities, basically giving up sports. But at the same time told me that having the surgery would not guarantee she'd be able to play again either and would require even more and longer physical therapy. What do I do? I will do whatever needs to be done to help her life in the long run. I only want to do what is best for my daughter. I have researched this hours and days on end but am having trouble finding the information I'm looking for. Alot of what I find has to do with injuries/torn ligaments etc. Your opinion is appreciated more than you will ever know.